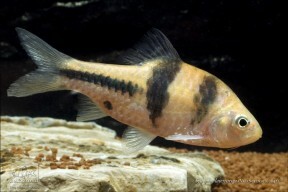 Subadult from the Singapore aquarium trade. Wild fish in their natural habitat, southern Thailand. Individual from Perlis state, Peninsular Malaysia. 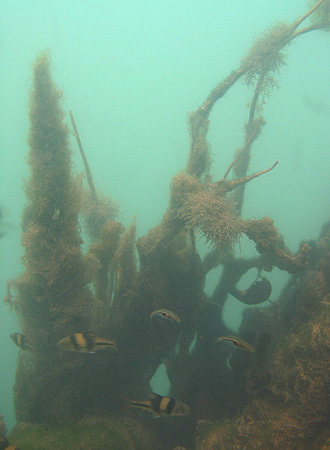 At the type locality of Betta simplex sympatric species include Barbodes lateristriga and Trigonostigma espei. Freshly-collected specimen from Kedah state, Peninsular Malaysia. Freshly-collected specimen from the Napuh River, South Sumatra province, Sumatra. Wild caught specimen from the aquarium trade that displayed distinct DNA compared with the 'normal' ornamental form. 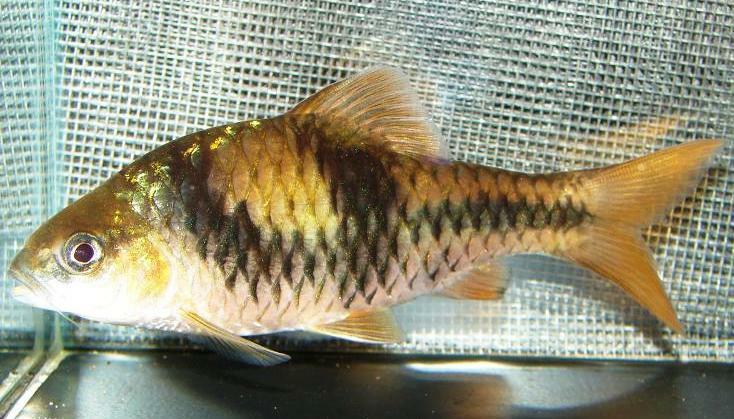 This fish was sold as B. kuchingensis but appears to be a variant of B. lateristriga. 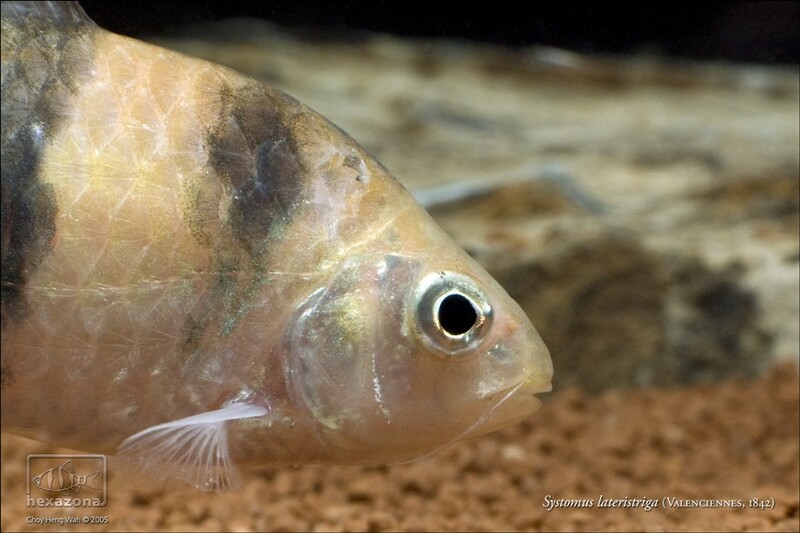 Barbodes: from the Latin barbus, meaning ‘barbel’, and Ancient Greek εἶδος (-oides), meaning ‘form, likeness’. lateristriga: from the Latin latus, meaning ‘flank’, and striga, meaning ‘row, strip’. Type locality is ‘Java, Indonesia’, but this species is currently considered to be distributed throughout southern (peninsular) Thailand, Peninsular Malaysia, Sumatra, and Java, plus some smaller islands in the South China Sea such as Tioman and the Anambas archipelago. 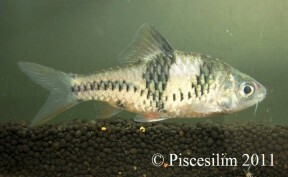 The fish vary in appearance somewhat depending on locality with a number of variants recognised (see ‘Notes’). 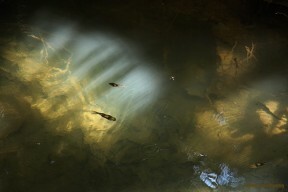 Predominantly inhabits forest streams containing clear water, often in the pools that form at the base of waterfalls. Substrates may comprise smooth, water-worn rocks and boulders of varying sizes, sand or gravel, often with submerged woody structures, leaf litter, and aquatic plants from genera such as Cryptocoryne or Barclaya. Flow rate tends to vary both with locality and time of year. It’s also been recorded from ancient peat swamps and associated black water streams with tannin-stained water, negligible mineral content and pH as low as 3.0 or 4.0. While juveniles and subadults may be found in shallow water and minor tributaries, adults appear to show a preference for larger, deeper channels and pools. Base dimensions of at least 150 ∗ 45 cm or equivalent are required. This can be further furnished with driftwood roots or branches, and while soft-leaved plants may be eaten hardy types such as Microsorum, Bolbitis, or Anubias spp. can be grown attached to the décor. Though torrent-like conditions are unnecessary it also does best if there is a high proportion of dissolved oxygen and moderate water movement, plus weekly water changes of 30-50% tank volume should be considered routine. Wild fish are probably foragers feeding on diatoms, algae, organic detritus, small insects, worms, crustaceans, and other zooplankton. In the aquarium it’s easily-fed but the best condition and colours offer regular meals of small live and frozen foods such as bloodworm, Daphnia, and Artemia, alongside good quality dried flakes and granules, at least some of which should include additional plant or algal content. This species is quite boisterous and can easily intimidate less robust species with its size and activity, especially at feeding times. In a spacious aquarium it can be combined with other robust fishes such as larger Danio, Devario, Barilius, Garra, and certain loaches. As always proper research is essential in order to avoid problems. In nature juveniles form large aggresgations but as they mature males in particular tend to become more solitary, and adults can be belligerent if space is limited. 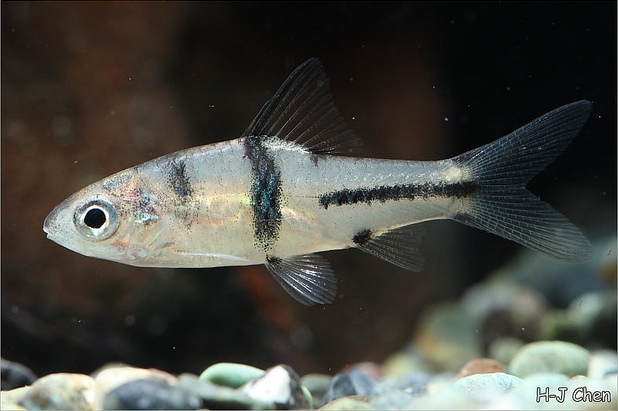 In theory the most aggression should be contained if a group of 6 or more specimens is purchased as the fish concentrate on maintaining their hierarchical position within the group, but mixed reports exist and it may be that behaviour varies depending on population. Adult males develop a more intense colour pattern than females, exhibit noticeable tubercules on the head when in spawning condition, and in some cases develop an enlarged head profile. 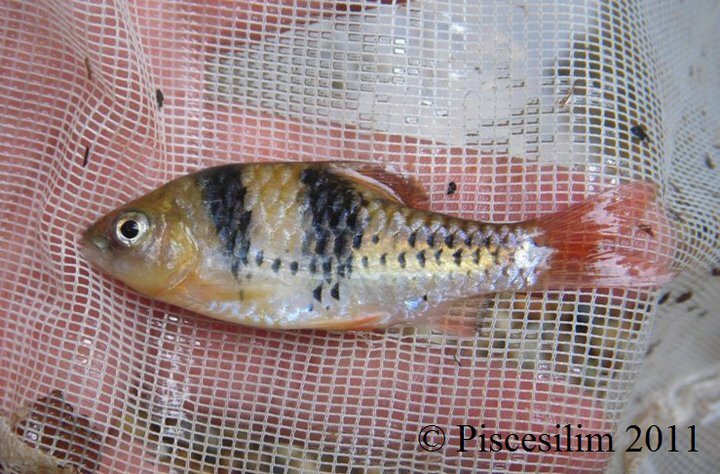 Like most small cyprinids ‘Puntius‘ spp. are egg-scattering free spawners exhibiting no parental care. When in good condition they will spawn often and in a mature aquarium it’s possible that small numbers of fry may start to appear without intervention. These should hatch in 24 – 36 hours with the fry free swimming after 3-4 days. They should be fed on an infusoria-grade food for the first few days until large enough to accept microworm, Artemia nauplii, or suchlike. This species is also commonly-referred to as ‘T-barb‘. 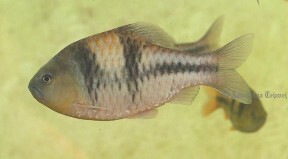 It’s closely-affiliated with and sometimes traded as the congener B. kuchingensis but that species can be told apart by colour pattern comprising a prominent row of dark spots along the lateral line, plus a short, horizontally-orientated streak extending from the upper part of the operculum. In B. lateristriga the lateral markings usually form a solid stripe and there is no streak extending from the operculum. B. lateristriga exhibits a relatively variable colour pattern depending on locality and Tweedei (1961) recognised 6 regional forms from Peninsular Malaysia alone, with those from the northern states of Kedah and Perlis possessing a significant reduction in the degree of dark patterning, for example. The form most commonly seen in the aquarium trade corresponds most closely to that from Johor, and the DNA of fish from northern Peninsular Malaysia (Kedah and Perlis states) has been found to be distinctly different (R. Collins, pers. comm. ), but it remains to be seen if the species as currently recognised represents a complex of closely-related taxa or not. 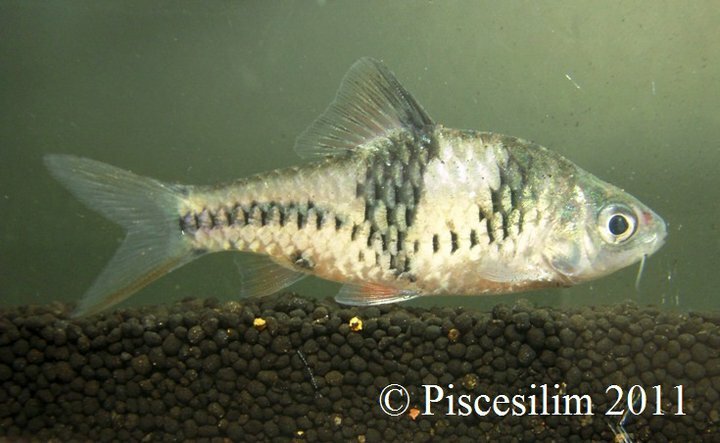 This species was formerly included in the genus Puntius which was for a number of years viewed as a polyphyletic catch-all containing over 100 species of small to mid-sized cyprinid until Pethiyagoda et al. (2012) published a partial review covering South Asian members. The majority of sub-Himalayan Puntius species were reclassified and new genera Dawkinsia, Dravidia (subsequently amended to Haludaria), and Pethia erected to accommodate some of them, with the remainder either retained in Puntius or moved to the existing Systomus assemblage, though the definition of the latter was altered meaning some Southeast Asian species formerly placed there could no longer be considered members. Kottelat (2013) published a comprehensive nomenclatural update for Southeast Asian fishes in which this species was among a number of former Puntius transferred into the genus Barbodes. Members are told apart from related genera by the following aspects of ontogeny and colour pattern: small juveniles have 3-5 dots along the midlateral scale row, including one at middle of caudal- fin base, and an additional one at dorsal-fin origin; with increasing size, the spots on midlateral row may become more numerous and may fuse to form a stripe or broad band, and the spot at dorsal-fin origin may become a large blotch or a broad bar. In addition, the following characters are useful in identification of Barbodes spp. : last simple dorsal-fin ray serrated posteriorly; rostral barbels present (except in B. aurotaeniatus); maxillary barbels present; lips smooth and thin, postlabial groove interrupted medially; lateral line complete or not, with 22–32 scales on lateral line row on body; ½4/1/4½ scale rows between dorsal-fin origin and ventral midline in front of pelvic-fin base; 12 circumpeduncular scale rows; 12–15 gill rakers on first gill arch. Histoire naturelle des poissons. Tome seizième. Livre dix-huitième. Les Cyprinoïdes. 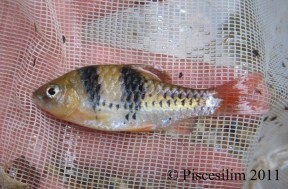 On a collection of freshwater fishes from Endau-Rompin, Pahang-Johore, Peninsular Malaysia. The Inland Fishes of Pulau Tioman, Peninsular Malaysia. The freshwater fishes of Java, as observed by Kuhl and van Hasselt in 1820-23. Notes on Malayan Fresh-water Fishes. 9. Regional differentiation in the colour pattern of Puntius lateristriga.